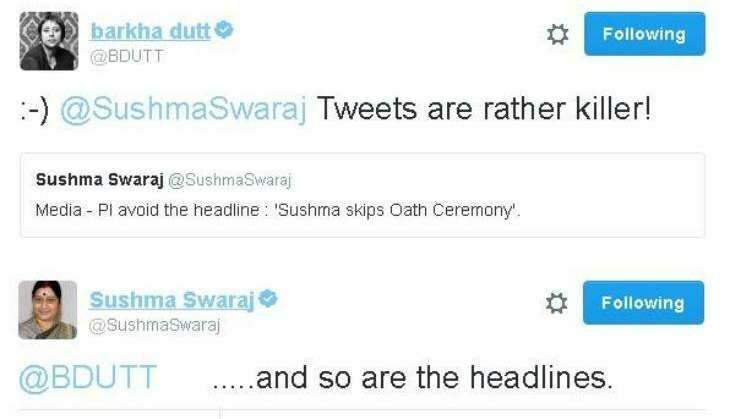 Disclaimer: This is an appreciation post for the artist that is our Minister of External Affairs, Sushma Swaraj, when it comes to Twitter. So if your political ideology stops you from experiencing the finer aspects of life, you might want to leave now. It is a truth universally acknowledged that if there is one thing Prime Minister Narendra Modi's ministers excel at, it is their social media game. Almost as if they were trained to be so. But training is one thing, natural unbridled, wit and sass is another. And, heaven and hell would agree that our honourable Minister of External Affairs needs to be crowned as the undisputed Yaas Queen of Sass since she pulled off this epic move this morning. Unable to attend the oath-taking ceremony of PM Modi's first cabinet reshuffle in two years, the minister tweeted this out. Media - Pl avoid the headline : 'Sushma skips Oath Ceremony'. Her fans loved it, her detractors loved it, even the media towards whom this A-grade shade was aimed at loved it. Complimenting the minister, journalist Barkha Dutt tweeted this. The reply she received in return - though aimed at media in general - probably caused a Grade A burn. @BDUTT .....and so are the headlines.